​Living ​under the Colorado sunshine, your skin needs extra care! Having ​permanent makeup allows you to play hard and always look good! Here at Boulder Aesthetics, Irena Fomenko offers services to beautify and enhance your skin, look and body. 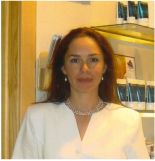 Serving her Boulder, Colorado County clients since 1995, Irena is a highly professional and educated Aesthetician, RN. And Irena's gift to you choose an Eyebrow Tint or a Lip Wax. O2 FACE LIFT + FREE GIFT! Give your skin a "hidden" gift. ​Join Irena's "Boulder Aesthetics News" for monthly updates & specials! Boulder Aesthetics (formerly "Master Studio Flamingo" and "Irena's Timeless Beauty") has been serving the community of Boulder and beyond since 1995.